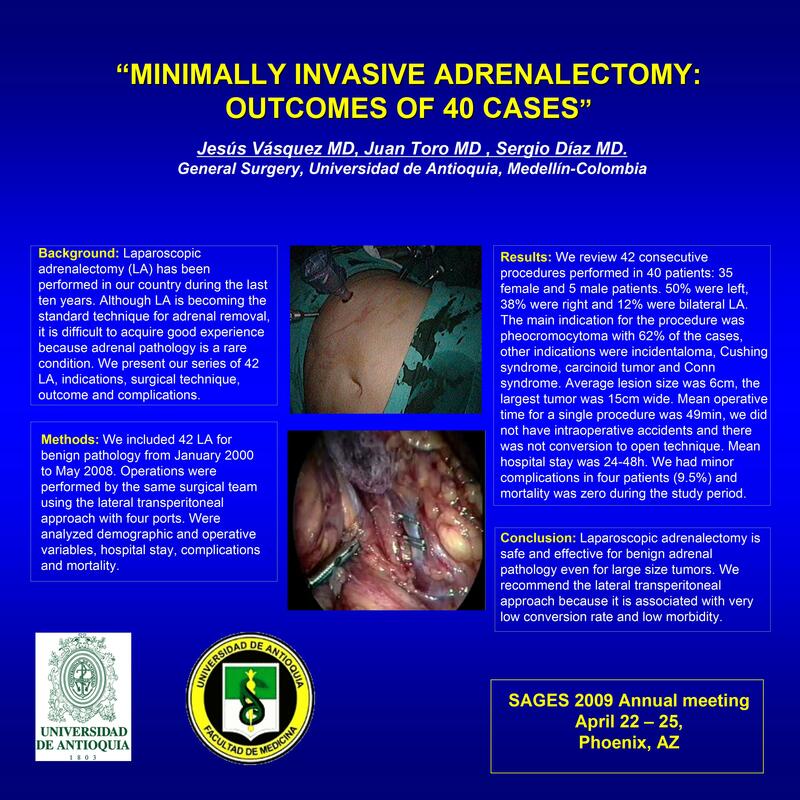 Minimaly Invasive Adrenalectomy: Our Experience in 40 Patients. INTRODUCTION–Due to its retroperitoneal anatomy, minimally invasive adrenal surgery is considered the procedure of choice for benign adrenal tumors. Because of potential hemorrhage, surgeons performing these operations should be experts in the field but, being an infrequent procedure, it is difficult to gain expertise and to master the procedure. METHODS AND PROCEDURES–. We included all patients operated by the authors (JV and SD) from January 2000 to May 2008. Surgical approach was transperitoneal with the patient in a lateral decubitus position and using 4 trocar ports. Surgical strategy was based on identification of the vena cava on the right side and of the renal vein on the left side. Patient’s records were reviewed for demographics, surgical variables, hospital stay and morbidity. RESULTS– 42 adrenalectomies were done in 40 patients (Bilateral Simultaneous in 2 cases). 35 were female and 5 were male. Mean age was 42 years. There were 21 (50%) left sided procedures, 19(45%) right sided and 2 bilateral(5%). Indications, in order of frequency were: pheochromocytoma (62%), incidentaloma, Cushing’s syndrome, carcinoid tumors and Conn’s. Tumor size was on average 6 cmt, the largest having 15 cmt. Mean operative time was 49 minutes. There were no conversions to open surgery. Minor complications occurred in 4 cases (9.5%) with no mortality. Mean hospital stay was 2 days. CONCLUSIONS – Laparoscopic adrenalectomy is safe and effective for benign disease, even for large tumors. Lateral transperitoneal approach is the preferred option having very low conversion rate and morbidity.